Clarifications on Ruth "the illegal immigrant"
On March 10th, I wrote a piece on my blog praising the Biblical character Boaz for showing compassion to Ruth, whom I referred to in the article as an “illegal immigrant.” Ruth, as you may know, was a descendant of Moab and according to the law at the time was supposed to be excluded from the congregation of Israel (Deuteronomy 23:3). God apparently was so angry with the Moabites that He even tells the children of Israel “not to seek their peace nor their prosperity all their days forever” (Deuteronomy 23:6) and yet when we read the Book of Ruth we all seem to know instinctively that Boaz is a hero in the story precisely because he showed compassion to Ruth despite what the law–even God’s law–said. Within days the article appeared on several high traffic sites. Almost immediately people began accusing me of twisting the Scriptures by calling Ruth an “illegal immigrant.” After all, Ruth was married to an Israelite and the law said that Moabites were only supposed to be excluded from the assembly of the Lord, not from the people of Israel (Deuteronomy 23:3). The response was so strong that I even began to second guess myself–until I read Nehemiah chapter 13 and it dawned on me that it was against the law for a child of Israel to marry a Moabite in the first place–which is exactly what Boaz did in the story of Ruth. No matter which way you look at it, Boaz did what even God’s law forbade and He was commended for it–by God. 2. People have commented that my illustration of Jesus defending the disciples picking grain on the Sabbath was taken out of context. The argument goes that all Jesus was doing was proving that He’s the Lord of the Sabbath, therefore He can do with it what He wants. I agree that Jesus was showing His lordship over the Sabbath, but that still doesn’t negate the fact that Jesus used the word unlawful to describe what David did when he ate the showbread in the house of Abiathar the priest–and commends him for it (Mark 2:25-26)! I go back to my original question. If God commended people for breaking His laws because of compassion for their fellow human beings, what might He think of people today who challenge man-made laws for reasons of human compassion? I can understand why some would take issue with using the word break, but is the word unlawful any less offensive? The point is still the same. It appears that in Scripture, God commends people for choosing human compassion over the letter of the law. 3. I realize that calling Ruth an “illegal immigrant” isn’t a direct correlation to the situation we have today, but that’s not the point. It would have been very easy for Boaz to think of Ruth in terms of an illegal immigrant, and he could have used some great “the Bible tells me so” justifications to deny her compassion according to the consensus of the religious elite of his day. That was before the new Arizona immigration law. I realize that the law is controversial and that there are legitimate issues of border security that need to be addressed, but who would have known that within a few weeks of my article appearing on the Free Republic, the state of Arizona would pass a law that, among many other things, criminalizes compassion to illegal immigrants? As Eugene Cho points out in his post, The law states that those who “knowingly transport or harbor” undocumented immigrants will be at risk of arrest. In other words, if an individual, or perhaps a church or faith institution, takes an illegal immigrant to a grocery store or provides food, clothing, and shelter for an illegal immigrant, they could be arrested. How does that square with the direct command of Jesus to take in strangers (Matthew 25:35)? The answer is it doesn’t. Showing compassion to another human being should never be illegal, and if it is, then Christians are obligated to “obey God rather than men” (Acts 5:29). I’m not saying that I have this conundrum figured out as to how followers of Jesus should balance upholding the law with human compassion. So with that, my parting words on this issue will be a quote from the beloved Apostle Paul. “The letter kills, but the Spirit gives life” (2 Corinthians 3:6). On Friday I’m leaving for Ethiopia with my dad to pick up my adopted son Isaac Biruk Taylor. We’re arriving the day after the election. I hope and pray that there’s no unrest in the country. If there is, I’d rather be there with my son than sitting back in the U.S. helpless. My wife and I have waited a long time for this. Adoption is a wonderful way to live out the Christian faith, since its an expression of what God does for us when He adopts us into His family in Christ. Our reasons for adopting weren’t that spiritual though. We just wanted a son. After we started the adoption process my wife got pregnant. On January 5th 2010, my wife gave birth to our son Christian David Taylor. Now we’ll have two boys. We’re not planning on having any more children. I pray that God will give our family many great memories together. The mother was in anguish. She had no idea that her child had already formed these assumptions. Various experts gave their explanations. One expert thought that America’s racist culture emitted cultural cues so strong that even a child could pick up on them. Another expert, which I thought was more likely, suggested that children naturally assume that people that look like them share their same traits. One of the possible clues to the puzzle was that the mother said that her son does not live in a diverse community. All of the experts agreed that it’s important for parents of young children to befriend people of all different racial backgrounds so that the children can learn diversity from the beginning. In other words, teaching children about accepting people of other colors is one thing. Living it is another. God, help me to live a life of love and acceptance of others, not just talk about it. 5. You can buy pear brandy, with a real pear inside the bottle. The pear is whole and ripe, and the bottle is genuine; it hasn’t been cut in any way. How did the pear get inside the bottle? 1… The one sport in which neither the spectators nor the participants know the score or the leader until the contest ends: Boxing. 2. North American landmark constantly moving backward: Niagara Falls ..
7. Fourteen punctuation marks in English grammar: Period, comma, colon, semicolon, dash, hyphen, apostrophe,question mark, exclamation point, quotation mark, brackets, parenthesis, braces, and ellip ses. 1,200 young people dancing in the streets in Hungary–Awesome! This is one of the most uplifting videos I’ve seen in a while. My mom is always forwarding me things like this. I thought I’d share this one. Sometimes in life you learn best not from the times that you shine, but from the times that you act like a total ignoramus. It seems that racism and fear of outsiders are on the rise in the U.S.A. With this in mind, I’d like to share two different occasions in which my big mouth revealed my profound racial ignorance. I’m sure there are more, but these are the two that I remember the most. Ignoramus moment number two: It was 9 years ago. I was working as a telemarketer. Lessie was an African American woman around my age that sat a couple of seats down from me. We often talked and laughed about many things to make the day go by faster. One day Lessie got on the subject about people that live in the ghetto. Without giving it much thought I blurted out “Why don’t those people just work harder? Then they could leave the ghetto.” Lessie went off on me. “You have no idea what you’re talking about! You don’t know how hard it is to grow up in the ghetto!” Lessie was right. So why am I bringing this up years later? Because in two weeks I’m traveling to Ethiopia to pick up my adopted son. Before we were married my wife told me that she always wanted to adopt from Africa. At the time I didn’t think much of it, but after years of miscarriages and fertility specialists we finally decided to adopt. About a month after we started the adoption process, my wife got pregnant and now we have the world’s cutest baby, but in about three weeks I’m going to be the father of two boys, a black son and a white son. Over the past several years I’ve worked hard to educate myself on racial issues the best that I can. For example: I know that white privilege and institutionalized racism are verifiable realities that exist today despite the claim by many that white people are now the victims. I no longer believe—thank God—that the reason why most black people in America vote Democrat is because all they want is a handout from the government. Basic knowledge of history and sociology can go a long way to clear up these misunderstandings, but the problem is that these are things that you get from a textbook. The real question that I’m pondering is something that I’ll never be able to get from a textbook. How do I as a father teach my son to respect his culture (both as an Ethiopian and as a black American), to identify with the black American experience, which means recognizing the historical sins of the past and how they’ve contributed to the ongoing realities of white privilege and institutionalized racism; how do I do all that without stifling his individual drive to succeed? I want my son to grow up believing that through faith, hard work, and perseverance anything is possible in this great country of ours even though I know that our nation’s history of racism has made it more difficult for some racial groups to succeed than others. How do I balance concrete reality with faith, imagination, and a sound work ethic? I’ve asked some of my white friends this question. The typical response I get is that while I should teach my son to respect his culture, I shouldn’t dwell on the sins of the past and on institutionalized racism today because that would stifle his individual creativity and work ethic. I can understand that perspective, but I think it would be wise to hear from black Americans on this issue. I have a feeling that my question is anything but new and unique to most African American households. I also have a feeling that there’s a broad range of opinion on this issue within the black community. If you’re a black American and you’d like to share your experience with me on how you’ve dealt with racism, both individual and institutional, and how you’ve overcome obstacles to create a life of meaning and purpose for you and your family, then I’d like to hear from you. ImageThe stove is standing outside under the sky, next to it a washing machine and in the background a big white tent. We are sitting in what till yesterday used to be the living room of the Moussa family, around us nothing but the little remains of the outside walls. The Moussa family owned 4 houses on their property where different parts of the family lived. It is actually not really appropriate to speak of houses since the buildings mostly just include one room, a bathroom and a kitchen, all constructed with simple concrete blocks and a tin roof on top. In 2002 the first of them got demolished the when Israel’s Government started to build the Road 60 to connect the settlements like Efrat directly to Jerusalem and to each other. In this time the family lost a lot of their land to the wall which is supposed to protect the street now stretching through the valley underneath their land. The Israeli Government came back on the 12th of February 2004 and demolished not only the rebuilt house but along with it two more. In this time it was snowing which made the whole situation even harder to suddenly stand on your land without having a roof above you to protect you from the outside conditions. Since just one house remained on their property which was not demolished, the whole family had to live together with 17 people in one room. 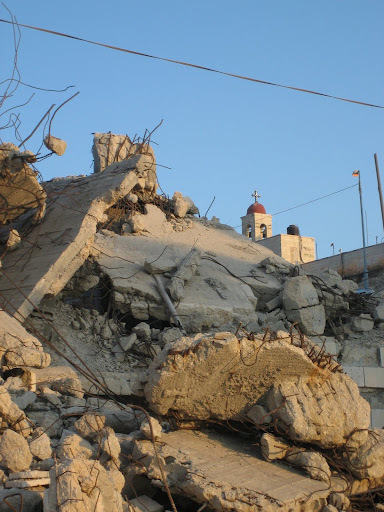 In 2006 Israel’s High Court decided to freeze demolitions on the Moussa family land. ImageOn the 14th of April, 2010 at around 10:00 am the bulldozers rolled into the town of Al’ Khader and up the hill to the property of the Moussa family.When they arrived, the administrator was asked by Ali Moussa’s son to show the papers with the order for the demolition of this house but in the end he never saw them. At this time their lawyer was already on his way to Al’ Khader with the decision by Israel’s High Court, declaring that the demolition is not legal. Everything went really fast, the family begged the soldiers to at least wait till the lawyer arrives but they already started their work. The lawyer arrived but not one of the present soldiers paid attention to the court decision and within 5 minutes the whole house was destroyed. So for the third time all that is left are pieces of tin roof lying around, debris, and a family without shelter. The 8 year old son of the family came home from school just after the bulldozers had left again and he simply did not understand why his home suddenly was completely vanished. He was running around crying and asking his father and his brothers why but nobody could give him an understandable answer. On the other side of the valley our home rebuilding project for the Salah’s family is about to get finished and to watch that process while standing in the ruins of another just demolished home seems ridiculous but hopefully it will be possible to rebuilt this simple house within the next days with the support of Al’ Khader’s municipality.